This jacket has been a side project of mine for a couple weeks now, and I must say I think it's coming along pretty nicely. I have no idea what warehouse my local vintage shop sources from, but every once in a while, I'll find something really kooky that begs to be experimented with, and this jacket is a prime example of such an occurence. When I found this guy, it had a few pieces of rhinestone jewelry and seed beading sewn on the back and front which I have edited and added to pretty extensively. Some of the individual pieces have rusted, making the surrounding denim look even older and rattier, which I can't help but love with all the cheesy opulence. I had some costume jewelry lying around that I was never reaching for, and so I broke a few pieces and had some individual strands hang off the collar, down the shoulders and front pockets. 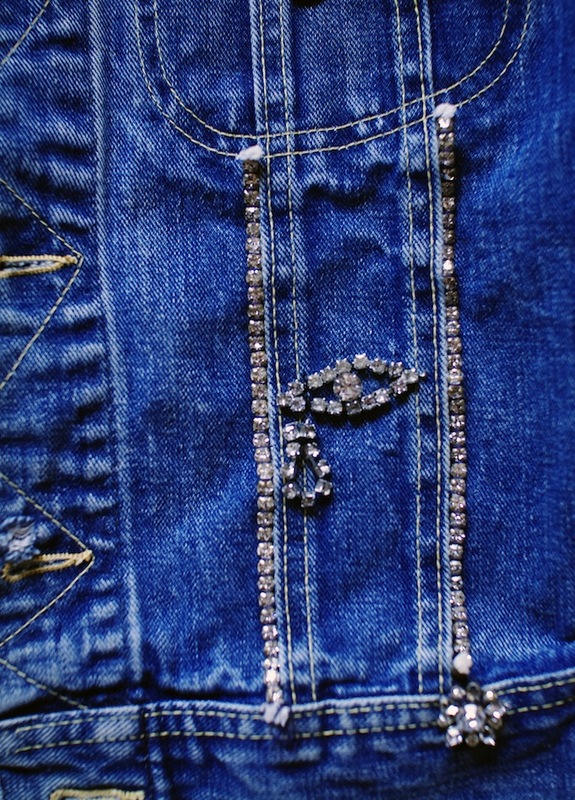 I had a rhinestone evil eye bracelet, which I broke apart and reworked into a crying eye on the front, which I guess is my sort of nod to those 70's homemade punk jackets that kids used to save up for, and then add to over the years as they lived in 'em. We'll see where this one goes, hopefully it won't fall apart by the time fall rolls around, 'cause I'm sure as hell not wearing this thing everyday with this heat we're having. Love what you did with that jacket. I LOVE what you've done with the jacket- it looks amazing and so one-of-a-kind! I will try and come to that event- it would be lovely to meet you! Wow I really love the jacket & your vintage dress. Looks fabulous! Love what you did with the jacket. Very unique!